The percentage of professional music reviewers who liked this. Above 75% is gold. ? USER SCORE:0%The percentage of users who liked this based on high quality reviews from sources such as Google Play, iTunes, and Amazon Music. Above 75% is green. ? The session shows a band in very good shape, which is audible to play - even if it is only in a studio environment. It is undeniable that this is a very well-kept, good-sounding live-registration and creates a nice picture of how the band will perform on stage. There are few live albums that offer much in the way of ideas, but this one makes perfect sense. Electric Lady Sessions perhaps best functions as the defining calling card of a post-reunion LCD Soundsystem. Electric Lady Sessions is an honest, straightforward album, and the world could use a few more of those. 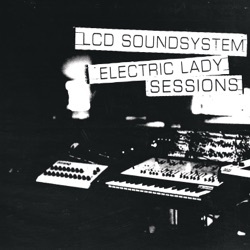 As unexpected as it may sound, Electric Lady Sessions is the most essential live document in LCD Soundsystem’s catalog. Synth Pop, Disco, Art Rock: An interim album with new recordings of own songs and three cover versions. On Electric Lady Sessions, LCD Soundsystem strip back and then bone up the grooves that have always made their music work, despite its contradictions.